Will Madden 18 be Available on PC? Since all of EA’s games are moving to the Frostbite engine will we see another Madden game come to the PC? EA did a interview back in July and stated that the reason why they stopped porting Madden to PC was because of poor sales. The last Madden game to release on PC was Madden 08 back in 2007. It’s come up to 10 years since we’ve seen a Madden game on PC. EA’s excuse is lack of sales, but PC gaming has evolved so much since then. Steam has exploded to be the number 1 PC gaming platform by a very large margin. Nothing comes close and I believe that a Madden game would make the top selling games list on Steam if it were to be released. Madden 08 was a okay Madden game. It got decent review scores from major review sites back then, but it wasn’t the best Madden game. It’s poor sales on PC prove that, but it’s been heavily modded for 9 years now because of the lack of Madden games that we have on PC. EA said that they’re open to the idea because the Frostbite Engine makes it easier for them to port games and I’m really hoping that they give it some serious thought because I’m not going to buy a console to play my sports games anymore. I’m done with console gaming so if I have to miss out on my Madden games I’ll just have to accept it. The last Madden game I played was 15 and it was good, but lacked a lot of features. When consider how much Steam has grown in the last 10 years it would be crazy not to take advantage of it and make more games on it. Even if you don’t use Steam it would still sale in my opinion. I think Origin is a great platform too. Most people hate it because it’s EA’s version of Steam, but I have no problems with it. I own over 20 games on Origin. Give Madden another shot on PC. It’s been too long and I think it would sell well on PC. It won’t outsell it’s console counterparts, but I think it would do well enough to become a regular thing on PC. What do you think? Should Madden come to PC? For players who love football, I believe we will choose between EA’s and KONAMI’s live football 2017>. At present, these two games have been officially on sale.In terms of the quality of the game alone,the two are very good, and user’s evaluation and scoring are very high. However, from the sales point of view, FIFA17 is better.Today, EA officially pushed the first upgrade patch, let’s have a look about what has been updated. The first is the addition of the Premier League broadcast interface.When the player chooses two Premier League teams to play a friendly game or in a career mode,it willautomatically use the English style broadcast screen. In addition,the problem that the Moves (Skill) will lead to the separation of the ball has been fixed,that is, players can relax in front of the handball and do a variety of fancy action. After this update,The balance of the game affixed to the pass (even at three under long) is weakened, but it increases the failure probability of pass way. Take players to improve switching kicks and penalties situation. General revision of controlled celebrations . Slightly improve the ball in the air pass reaction. Increased experience required for the higher overall ratings in Pro Clubs. As a result, for various players, some may think that you are just making a rewrite of it and that the rewrite is lower than the previous one. It is really intentional, but you didn’t give up a lot of development. Last, thanks for visiting mmocs.com, we not only provide the latest FIFA 17 news and guides, also have FIFA 17 Ultimate Team Coins for sale for ps4 and xbox one safe and cheap. Come and enjoy FIFA coins at great discount. In April of this year, if you are participated in the WorldGamingFIFA 17 Cup game on PS4 and Xbox, you will have the possibility to $500. 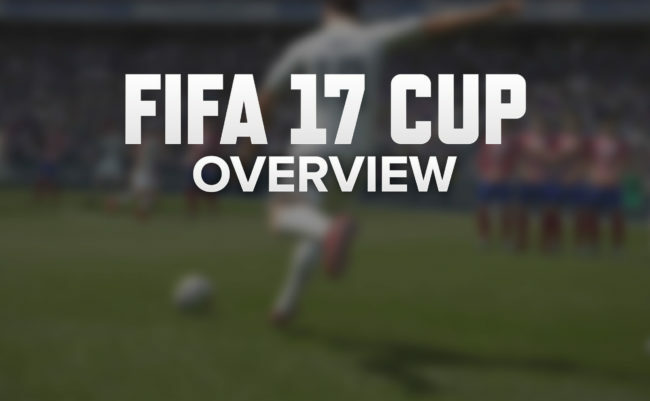 From April 1st to April 30th, you have the chance to participate in the FIFA 17 Cup brackets to earn medals, and the number of your medals depend on your position in the game. For the winner who earn the most medals in the game will receive cash rewards at the end of the month. If you win the bracket, you win 10 medals. For both PS4 and Xbox One, the top 8 medal earners every week win $5.